Hotel Gracery Tamachi is the perfect place to get your day off to a great start. Our hotel is located just four minutes away from JR Tamachi Station which provides great access to business and sightseeing areas such as Shinagawa and Tokyo. Guestrooms have a stylish interior with up-to-date facilities and are highly secure. Our hotel had the honor of being recognized for our hospitality with a place in the Michelin Guide 2012. For a treat, stay in one of our premium rooms on the top floor. These spacious rooms feature beautiful and luxurious glass shower rooms, high ceilings, and large windows. Guestrooms on the ladies’ floor have wooden floors and comfortable furniture. 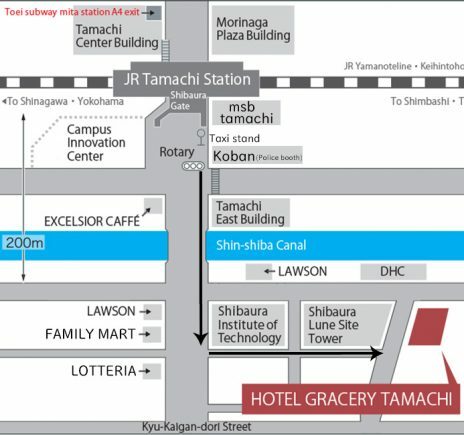 We hope you will feel at home at Hotel Gracery Tamachi.